Ah, the smell of a new car. That alluring, straight-from-the-factory fragrance of polyurethane and freshly laid carpet somehow draws millions of people each year into car dealerships around the country with the dream of driving off the lot in a brand-new vehicle. Unfortunately, those dreams are frequently dashed by the reality-check-inducing prices scrawled across the car windows — numbers well into the five digits, and well out of reach for many buyers without financing. But even with an auto loan, many consumers struggle to afford a new vehicle thanks to high interest rates and even higher car prices. And when borrowers with excellent credit are paying a fortune for their vehicles, you know the story is even more dire for those with lower scores. Each year, it seems that our vehicles get more and more advanced. The onboard computers are getting smarter, the engines are getting more efficient, and the whole vehicle is getting more connected through mobile phone compatibility and WiFi hotspots. As awesome as these features may be, however, they certainly don’t come free. The average price of a new car has risen to the point that even small cars now average $20,000 when purchased new, and a brand-new pickup truck will run you a startling $41,000 on average. The average transaction price for a new car is over $37,000. And used cars aren’t the same affordable alternative they used to be; the average price of a used vehicle topped $20,000 in the third quarter of 2018, putting the typical used car price on par with some new vehicles. 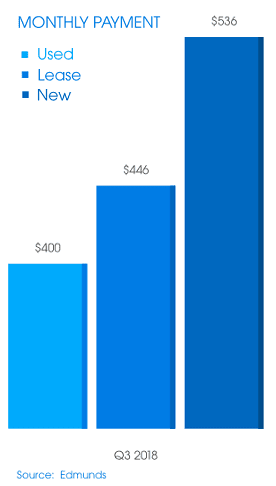 As a result of ridiculously high purchase prices, Edmunds sales data shows that the average monthly payment skyrocketed to an all-time high of $536 for a new car in the third quarter of 2018. Used cars still fare better — the average used car payment hovered around $400; however, this number still saw a noticeable monthly increase when looking at year over year payment data. And these numbers sound even more absurd when you consider how long the average auto loan term length has become. Gone are the days of two- or three-year auto loans; only 19.4% of new vehicle loans and just under one-third of used car loans had terms of 60 months (five years) or less. In fact, loans with a term length of 72 months were the most common selection for both new and used vehicle purchases. That’s six years of monthly car payments that are likely $400 or more. Perhaps more startling, however, is the number of auto loans now with terms of seven years or longer — more than one-third of new car loans and just under 20% of used car loans had terms that extended more than 72 months. And those weren’t even the longest loan terms; more than 1% of loans had terms up to nine years (96 months) long. While 1% may seem small, a $1.149 billion auto loan industry means that 1% could be worth more than $11 million. Of course, any time you’re looking at the “average” payment numbers for a credit product, it’s likely those numbers were crunched according to equally average interest rates that can be obtained by hypothetical consumers with a nationally averaged credit score. According to the Federal Reserve, the national average interest rate for a 60-month new car loan is 4.96% if obtained from a commercial bank. The numbers get higher when you’re looking at a used car, with Experian’s data showing a sky-high average interest rate of 9.4% for used auto loans. For most new car buyers, the average interest rate can be a good estimator, especially given that the average new car buyer had a credit score of over 700, according to Experian data. For used car buyers, however, the average credit score is around 615 — nearly to the subprime level. Moreover, subprime loans make up more than 30% of auto loan originations, a percentage that has nearly doubled since 2010. Of those loans, the vast majority are for used vehicles, with roughly 86% of subprime and deep subprime borrowers financing a used vehicle. In other words, poor-credit borrowers have two things working against them. Not only are they more likely to obtain a used car over a new car — and used car loans automatically come with higher interest rates than new car loans — but, as high-risk borrowers, these consumers will be charged an interest rate much higher than the national average no matter which type of loan they obtain. According to the data, in fact, subprime and deep subprime borrowers will pay an average of 18.12% interest on a used auto loan, which is about 8% more than nonprime borrowers and a full 13% higher than the average 5.1% rate paid by prime and super prime borrowers. Subprime and deep subprime borrowers are looking at an average interest rate around 13.54% even for new cars. That’s nearly twice as much as nonprime borrowers are charged and almost 70% higher than the 3.96% average interest rate prime and super prime borrowers are charged. To put the difference into perspective, consider a $20,000 auto loan with a 72-month term. If Greta Good-Credit can score a 5% interest rate, she would have a monthly payment around $322 and pay a total of just under $3,200 in interest fees over the life of the loan. For Bert Bad-Credit, however, a loan of the same size and with the same term length will come with an interest rate of 15%. At that rate, Bert’s loan will have a monthly payment around $423 and his total interest cost will be more than $10,000 over the life of the loan. All in all, the total cost of Greta’s $20,000 vehicle will come out to $23,200, while the same vehicle will cost Bert a total of $30,000, meaning Bert’s bad credit has an effective price tag of nearly $7,000. In our example above, we found out that bad credit can increase the cost of buying a vehicle by 50% or more thanks to the higher interest rates. But that example leaves out one key detail: Bert can potentially refinance for a lower rate. While longer car loan terms mean buyers are making payments for more years than they used to, it also means that there’s more time for borrowers to refinance at a lower rate at some point (or multiple points). Since even a few percentage points can mean thousands in savings on a large auto loan, this can be a huge help to many borrowers. When the economy is lagging a bit and interest rates decrease, refinancing at a lower interest rate can be fairly easy regardless of your credit score. However, 2018 alone has seen multiple interest rate increases, meaning you can’t simply rely on the average rate dropping when you refinance. On the bright side, one technique that’s shown to provide significant benefit to borrowers is to refinance after a credit score increase. 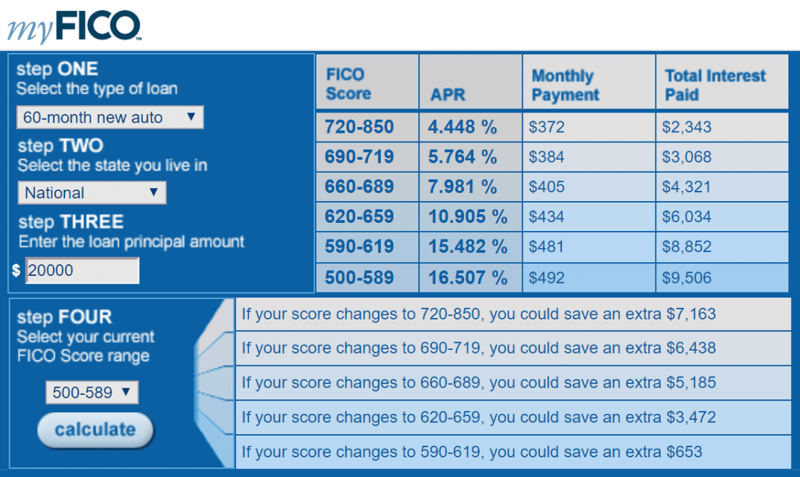 As myFICO data shows, an increase as small as a dozen points could boost you into the next scoring bracket and potentially reduce your interest rate by several points. And larger credit score boosts can have significantly more impact. These improvements could include things like paying down a credit card balance on a maxed-out credit card or having an old late payment age off your report. Depending on your credit profile, even simply building up six months to a year of positive payment history can result in a large enough credit score increase to show appreciable interest rate savings when you go to refinance. This means your auto loan itself could be a good tool for improving a low credit score and refinancing at a better rate. One important thing to keep in mind when looking for a refinance loan is that you should avoid extending your loan terms if at all possible. If your original auto loan had common six-year term, you’re already going to be making payments for longer than you’ll probably want to keep the car. Instead, aim to keep the same end-date for your refinance loan as that of your original loan so you’re not stuck paying off the same car for even longer. Or, if your interest rate decreased enough to make it affordable, obtain a shorter loan term that allows you to pay off your vehicle sooner. Even if you haven’t boosted your credit score enough to make for a significant APR drop — and especially if you have — the broader market has a number of options for finding a lower rate when you refinance, including new loan options born of the technological era. For example, one J.D. Power study found that nearly half (47%) of potential borrowers shopped for an auto loan online before they ever set foot in a dealership. What’s more, these shoppers were happier with their decision than those who didn’t bother to research their loan options before heading to the dealership. “As the auto shopper journey becomes increasingly digital, it’s critical for auto lenders to get the mobile app formula just right. While mobile app utilization is still highest among younger generations, older customers who interact with auto lenders via mobile app experience even higher overall satisfaction than their younger counterparts. Mobile is no longer a generational or niche offering; it is now the window into the auto lending experience.” — Jim Houston, Senior Director of Automotive Finance at J.D. Power. Online lending marketplaces, in particular, are a big draw thanks to their ease of use. These networks connect dozens, if not hundreds, of lenders from around the country with borrowers. 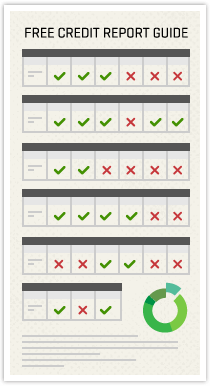 This allows users to fill out one application but potentially receive multiple offers at once, simplifying the comparison shopping process. Mobile devices are also becoming an important tool used by many types of shoppers, though young car buyers are still more inclined to use a mobile device in their search than their older counterparts. Shoppers who used a mobile app in their research also tended to be more satisfied with their experience overall. Additionally, new types of lenders are cropping up thanks to the digital revolution. Online-only banks and third-party lenders are becoming common, as are the consumer-powered peer-to-peer lending networks that allow everyday people to invest in loans for their, well, peers. In the offline world, credit unions are an increasingly popular choice for auto loans, with the credit union share of the auto financing market showing year-over-year growth in Experian’s data. Credit unions are responsible for more than 21% of the auto financing market, including 14.3% of loans for new vehicles. 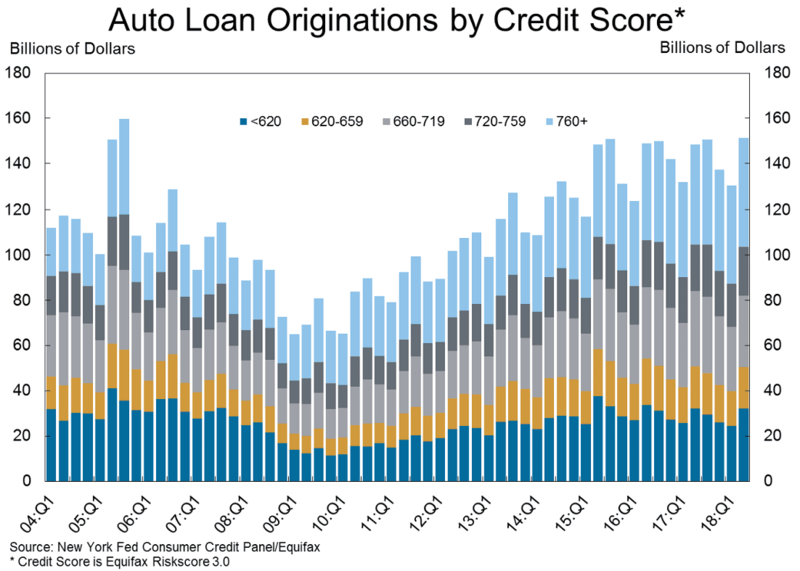 That said, it’s the used auto loan market where credit unions are finding significant traction. Credit unions possessed nearly 29% of the used-auto financing market in the second quarter of 2018, an increase of more than 2% over the previous year and only around 6% less than the portion of the market owned by commercial banks. It’s little wonder that credit unions are a top choice for borrowers of all credit types. Credit union auto loans not only have lower default rates, but they also tend to charge some of the lowest interest rates for both new and used auto loans. According to Wallet Hub auto loan data, the average interest rate for a new car loan from a credit union was just 4.47% in Q2 of 2018, and used car loans weren’t far away at an average of 5.4%. While car manufacturers still offer the lowest rates for new cars, it’s hard to find a lower rate for used vehicles. While the olfactive allure of a new car may be more in our heads than in our noses, it’s hard to deny the appeal of a brand-new car’s pristine interior and the thrill of being its very first driver — which is why millions of new vehicles are sold every year in the U.S. alone. But new car smell isn’t cheap. Worse, even if you forgo the new car smell in favor of not draining your bank account, you’re not getting off lightly as car prices continue to rise over the $20,000 mark for used and new cars alike. And, while financing can be a big help when it comes to making the purchase, high prices and high interest rates mean it doesn’t do much to actually help the bottom line. Indeed, according to the data, not only are buyers now making record-high monthly payments, they’re often doing so for the better part of a decade. In the end, the only real defense against the high prices of automobiles — and any other product you may need to finance — is to build and maintain a healthy credit profile. The higher your credit scores, the lower your apparent risk — and the lower your interest rates across the board.